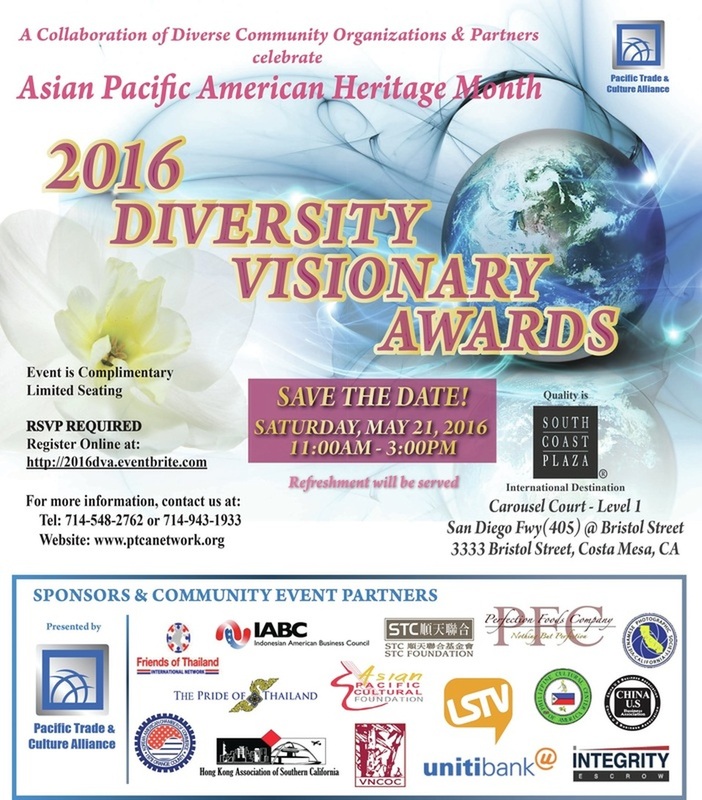 The 2016 Diversity Visionary Awards (2016 DVA) is a celebration in May commemorating Asian Pacific American Heritage Month. This year, it will again be held at South Coast Plaza at their Carousel Court on Saturday , May 21st, 2016, 11:00am to 3:00pm. This event brings together multi-cultural organizations, community sponsors, partners and supporters honoring and celebrating diversity and recognizing individuals for their work in diverse communities. South Coast Plaza continues their support of the Diversity Visionary Awards and the partnered organizations to make this event happen every year. 2016 DVA is recognized through the Pacific Trade and Culture Alliance (PTCA) as it spearheads this annual event together with this year's Community Sponsors: The Friends of Thailand International Network (FOTIN), the Hong Kong Association of Southern California (HKASC), the Indonesian American Business Council (IABC), the Korean American Chamber of Commerce (KACCOC). This year's Corporate Sponsors are Integrity Escrow, Perfection Foods and UNITI Bank. This year's Community Partners are: the China U.S. Business Association, Little Saigon TV, National Association of Asian American Professionals - Orange County, the Philippine Cultural Center of America, Inc., and the Vietnamese Photographic Society of California. Mistress and Master of Ceremonies are Leyna Nguyen, TV News Anchor; and Derrick Nguyen, Esq. Cultural and ethnic presentations will be performed, and refreshments will be served.